Well folks, the 2nd issue of the Sound-Bites series is fresh off the press with 10 full pages of rugged mountain music. Luckily the morning was rainy as heck and staring at a computer screen for many hours seemed an appropriate surrealistic pool to fall in. 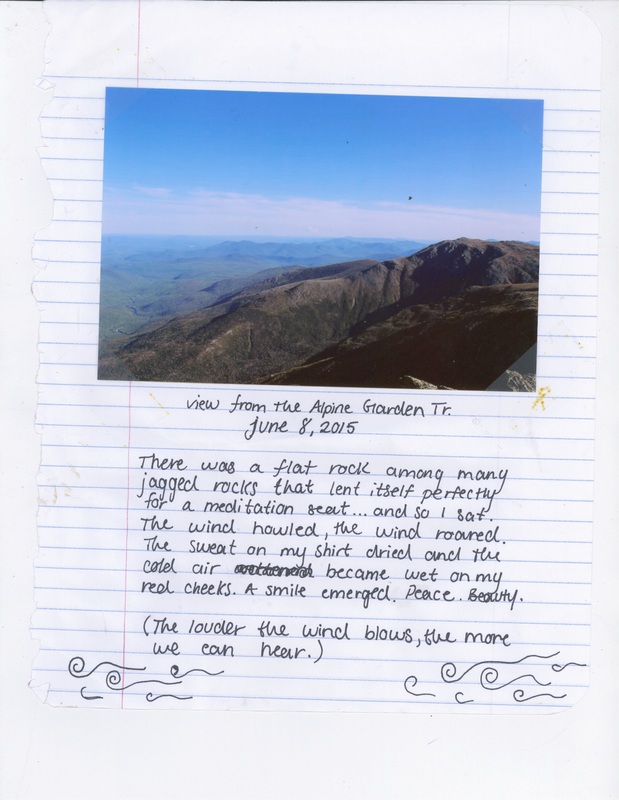 This zine includes submissions from contributers in New Hampshire, Massachusetts, Maine, Wisconsin, and New Mexicoall answering the question, How do the mountains sound. The submissions range from funny, thoughful, and strange to downright mystical. 45 copies have been printed and distributed to the detriment of the Gilford Public Library’s paper and ink stocks and the health of their budget. My sister says I am now indebted to plant exactly two trees in return for my 250+ pages. And if you’re still wondering what a zine is, it’s “an independently-run and rugged publication.” As I like to say, it’s a one-woman show, meaning I do most of the work and probably should hire an editor. Many people have asked about an online version of the zine. I am working on my design capacities for a real website, but for now I’ll be posting one submission every day here on the blog. Keep checking back for a full color and digitalized zine experience! This one’s from my great friend, Jill Banach, a hiker, photographer, and half marathon runner from Shrewsbury, MA.